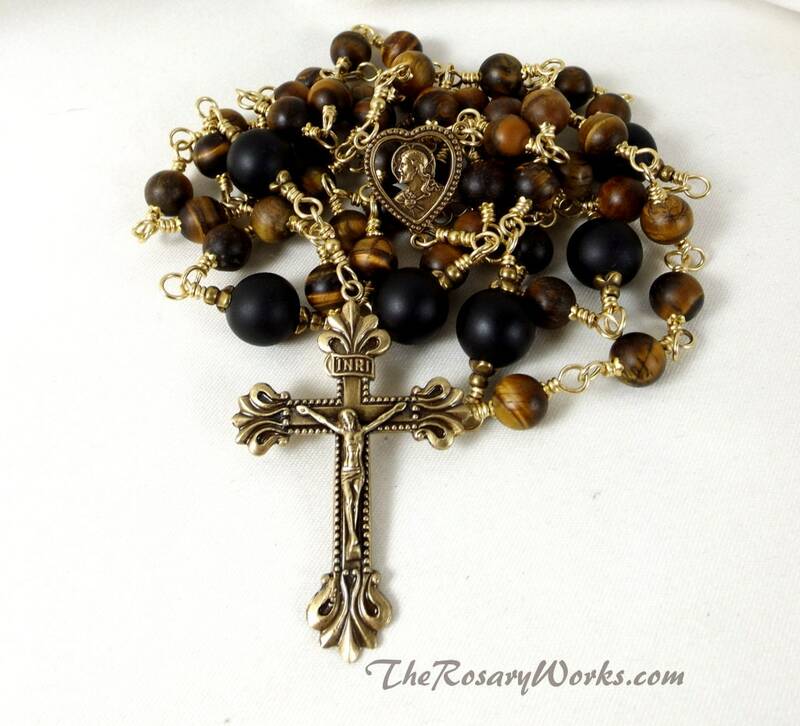 The Hail Mary beads in this striking rosary are 8mm matte tiger eye. I like these beads more than regular tiger eye because they more than the iridescence of regular tiger eye. They also show all the subtle variations of color that are not always visible in regular tiger eye. Some of these beads have small dimples in them, but that doesn't detract from the beauty of this rosary. The wonderful thing about these beads is that the more you handle them, the more beautiful they become. The matte finish on the tiger eye absorbs the oils in your hand and this brings out all the iridescence and subtle colors in the stone. The 12mm matte onyx Our Father beads provider a nice contrast to the tiger eye. The Sacred Heart center also known as a Scapular center is solid brass as is the ornate crucifix. The bead caps and wire are also solid brass. ABOUT UNBREAKABLE ROSARIES: This rosary was constructed in such a manner as to make it unbreakable with normal wear and tear. The solid brass wire is coiled 2 1/2 times at either end of each bead to secure it in place. Furthermore, the interlocking loops prevent the type of breakage you find with most rosaries. This rosary was made to last a lifetime with normal wear and care. GUARANTEE: I am so confident in this construction that I will fix it for free if it should break with normal wear and prayer. However, care should be taken with this rosary and all my prayer beads because it is possible to scratch, chip or break the beads. Thank you for taking the time to visit my shop and viewing my handmade rosaries, chaplets and prayer beads designed to enhance and deepen your rosary prayer.